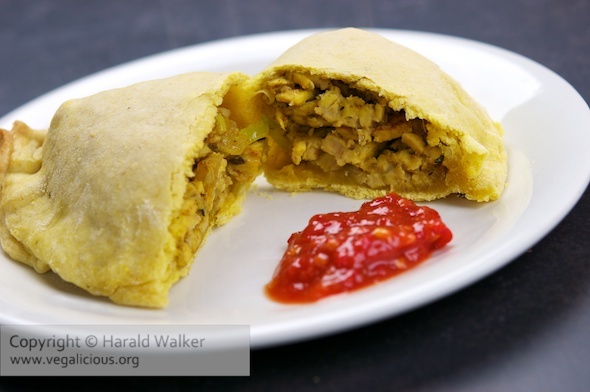 Jamaican patties make a great lunch, snack or dinner. We have enjoyed our own vegan ones for many years. Once we even made them in fun heart, cloud and flower shapes. We have always made and enjoyed the cabbage version of them. Recently we received an email from Vegetarian Times with their tempeh version. The recipe is simple and the dough does not take a long time to rise as it does not use yeast. We really enjoyed these savory turnovers, especially with a bit of sambal oelek. Posted by Chris Walker on February 9, 2011 in Reviews, Tempeh.